AFTER nearly three decades of prosperity as a farmer in Zvishavane’s Mapunzure area, elderly Regina Ndlela describes the last three years at her Mkatisa farm as a nightmare. Ndlela, a widow, says her family has never known peace since chrome deposits were discovered at her farm along the Gweru- Zvishavane highway. Syndicates of small-scale miners descended on the property and declared that they were now in charge. The miners soon dug deep pits in search for the “new gold”, leaving the farm that the family bought in 1992 a hazard for both livestock and people staying at the farm. Regular underground blasts left houses at the farm with wide cracks and Ndlela fears the structures will soon collapse. She has also lost livestock on a number of occasions when her goats and cattle fell into the pits left by the miners. “We are suffering at the hands of these people who seem not to have any concern for the environment or the people that live at this farm,” Ndlela said. “A number of our cattle and goats have died after falling into the pits left behind by the miners. Ndlela said the miners chase them away when using explosive close to the farmhouse. A number of cracks on the walls of the house are the most harrowing reminder of the terror the Ndlela family says visit them regularly. “They come here and chase us out of the house when they are about to detonate explosives,” she narrated. Ndlela’s nightmare is shared by many in the sprawling village, which has been taken over by syndicates, some of who are digging close to the Gweru-Zvishavane highway and close to schools. Mapanzure is now littered with disused opencast mine pits that have become death traps to villagers and livestock. Some of the abandoned pits are too deep for villagers to retrieve their dead animals. Japhet Mondera, who has lost a number of cattle after they fell into the disused mines, says the land degradation has become a serious threat to their livelihoods. “We are happy that there is now a move to rehabilitate the land after these youths, mostly working as syndicates, ravaged it through uncontrolled mining,” he said. The small-scale miners use heavy-duty equipment to extract chrome with little regard to infrastructure such as roads and schools. On the Zvishavane-Gweru highway, the miners are excavating land only a few metres from the road. 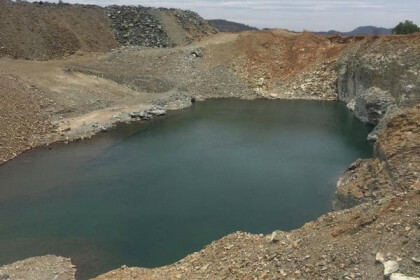 One of the miners, Tonderai Machira, who operates with a syndicate popularly known as ZimAssets, says they do not prioritise the rehabilitation of the land because of the low margins they realise from the venture. “We get around $70 per tonne of chrome ore, which we share with the claim owner, sponsor and the syndicate of around 10 people,” he said. The cost of hiring earthmoving equipment has gone up to around $100 per hour, making it prohibitive for the syndicates to hire plant and machinery to cover their tracks after mining. Midlands Provincial Affairs minister Larry Mavima says government is aware of the threats posed to the environment by uncontrolled mining. “We are a rich province in terms of mineral deposits, especially along the Great Dyke,” he said. “However, we need to ensure that the land can be used by future generations after we extract the resource,” he said. Mavhima said the government had since removed miners that were operating within 50 metres of the Gweru-Zvishavane highway and had hired a private company to rehabilitate some of the land. Meanwhile, Mbizo MP Settlement Chikwinya, a former worker in the chrome industry, said middlemen and end users of ferrochrome were reaping huge profits while communities in the mining areas were wallowing in poverty. “The communities including the workers in the chrome industry are left poor, their environment is polluted and their land is degraded,” he said. Chrome fetches high prices as a finished product mainly in China where it is used as an alloy in the production of stainless steel and aviation metals. Ferrochrome is mostly used in the construction of tall buildings as an alloy for steel reinforcements and it fetches over $1,35 per ounce after being smelted. The value of processed chrome is 100 times higher than that of newly-mined chrome.